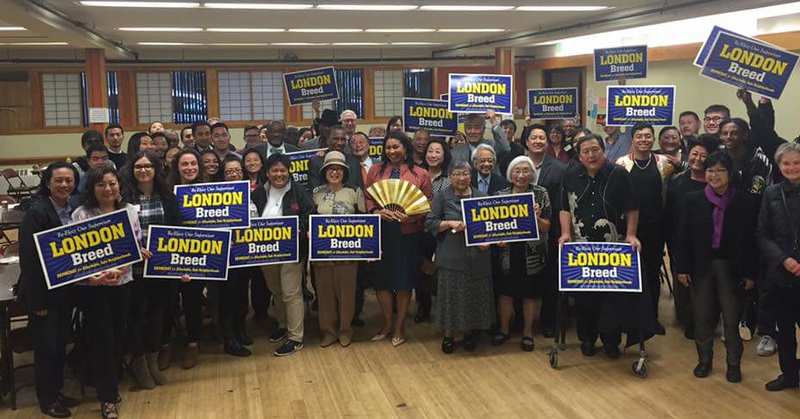 SAN FRANCISCO — A reception for San Francisco Supervisor London Breed, who is seeking re-election, was held on Aug. 25 at the Japanese Cultural and Community Center of Northern California in Japantown. Community leaders who hosted the reception include Jeremy Chan, Pat Fong, Bob Hamaguchi, Richard Hashimoto, Grace Horikiri, David Ishida, Mary Ishisaki, Caryl Ito, Richard Jue, Alice Kawahatsu, Vas Kiniris, David Lawrence, Lori Matoba, Jeff and Sandy Mori, Dr. Emily Murase, Paul Osaki, Robert K. Sakai, Yoshiro Tasaka, Rev. Arnold Townsend, and Monetta White. Speakers included Jon Osaki of Japanese Community Youth Council, Steve Nakajo of Kimochi, and Jeff and Sandy Mori, who have been leaders in various community organizations. Performers included storyteller Brenda Wong Aoki, composer/musician Mark Izu, and their son, Kai Kane Aoki Izu. “From growing up in the Western Addition, to serving as the executive director of the African American Art & Culture Complex, to her current role as supervisor and board president, London Breed has been a continuous member, partner, and supporter of the Japantown community,” event organizers said. Breed was sworn in as the supervisor for District 5 on Jan. 8, 2013. The neighborhoods she represents include the Fillmore/Western Addition, North of the Panhandle, Lower Haight, Haight-Ashbury, Cole Valley, Inner Sunset, Hayes Valley, Japantown, and Alamo Square. Her endorsers include Reps. Nancy Pelosi and Jackie Speier, Attorney General Kamala Harris, Board of Equalization member Fiona Ma, State Sen. Mark Leno, Assemblymembers David Chiu and Phil Ting, Assessor-Recorder Carmen Chu, Sheriff Vicky Hennessy, Public Defender Jeff Adachi, and Supervisors Malia Cohen, Mark Farrell, Katy Tang, Scott Wiener and Norman Yee. Breed’s opponent in the November election will be attorney and tenants’ rights activist Dean Preston. District 1 Supervisor Eric Mar (Richmond District) is termed out; 10 candidates have filed to replace him: Sherman D’Silva, Sandra Lee Fewer, Richie Greenberg, Jason Jungreis, Samuel Kwong, Brian Larkin, David Lee, Jonathan Lyens, Marjan Philhour, Andy Thornley. District 3 Supervisor Aaron Peskin (North Beach, Chinatown, Fisherman’s Wharf, Polk Gulch, Union Square/Financial District, Russian Hill, Nob Hill, Telegraph Hill) has one challenger, Tim Donnelly. District 7 Supervisor Norman Yee (Inner Parkside, Golden Gate Heights, Clarendon Heights, Twin Peaks, West Portal, Forest Knolls, Midtown Terrace, Forest Hill, Miraloma Park, Sunnyside, Sherwood Forest, Westwood Highlands, Westwood Park, St. Francis Wood, Monterey Heights, Mt. Davidson, Balboa Terrace, Ingleside Terrace, Stonestown, Lakeside, Lake Shore, Merced Manor, Park Merced) has four challengers: Joel Engardio, John Farrell, Ben Matranga, Michael Young. District 9 Supervisor David Campos (Mission, Bernal Heights, St. Mary’s Park, Portola) is termed out. Four candidates have filed to replace him: Joshua Arce, Iswari Espana, Hillary Ronen, Melissa San Miguel. District 11 Supervisor John Avalos (Cayuga Terrace, Crocker Amazon, Excelsior, Mission Terrace, Outer Mission, Ocean View/Merced Heights/Ingleside), is termed out. Five candidates have filed to replace him: Kimberly Alvarenga, Ahsha Safai, Francisco Herrera, Magdalena De Guzman, Berta Hernandez.